Le Chant de la Mer has access to the edge of the sea, natural pools along the hillside, and lush, tropical foliage. The property offers five bedrooms with ensuite bathrooms, which makes it perfect for couples or families traveling together. A telescope is on hand for looking at the stars, and guests can enjoy the great outdoors with a Jacuzzi, two BBQ areas, a veranda, hillside dining, a path to the sea, and a large wooden deck with lounging. There’s daybeds, chaises, and a gym, so any guest can find space to relax in their own way. Le Chant de la Mer is located on the Pointe Milou hillside within private, peaceful gardens. 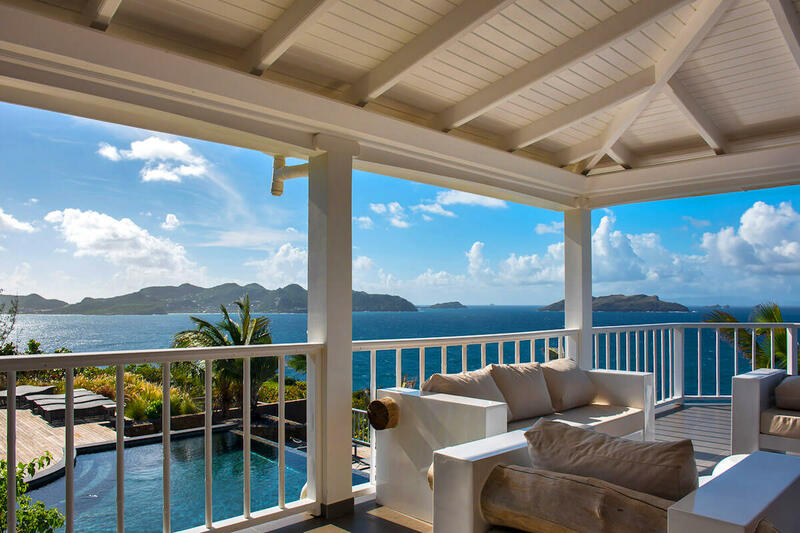 This villa rental has panoramic ocean views that glow at sunset. The infinity-edge pool faces the sea, and is surrounded by a wooden deck with daybeds and chaise lounges throughout. Guests can soak in the Jacuzzi with a glass of wine in hand and watch the sunset, or dine al fresco upstairs on the wide balcony. A set of stairs carved into the hillside leads down to the rocky beach and a circular dining table, which is the perfect place for special occasions. Guests can also eat in the veranda on the main level. Exercise enthusiasts can workout in the on-site gym, with cardio and resistance equipment, a TV, and tropical view. Inside, the Great Room has cathedral ceilings, fans, and a neutral color scheme that adds elegance. Lounge on the sofas and watch TV, or get some work done in the office overhead. An archway leads to the gourmet kitchen, which is fully equipped with a breakfast bar, espresso machine, basic appliances, a professional juicer, mixer, and deep fryer. The kitchen also has access to the back courtyard’s built-in pizza oven, pantry, and wine cellar. All five of the bedrooms are air-conditioned and have ensuite bathrooms. The master bedroom is located below the Great Room, and has an ocean view. It’s furnished with a queen-sized bed, flat-screen TV, DVD player, Wi-Fi, telephone, safe, and mosquito screens. Its ensuite bathroom has a shower, two wash basins, and a dressing area. The second bedroom is identical to the master, also located below the Great Room. The third and fourth bedrooms are located above the pool with ocean views, and furnished with queen-sized beds, desks, mosquito screens, and safes. The fifth and final bedroom is located above the pool, with ocean views, a queen-sized built-in bed, and a safe. Le Chant de la Mer has a great location in Pointe Milou, and is only a short drive from Lorient and Marigot Beach. It’s in a residential area, so guests can have peace of mind without sacrificing privacy. Daily housekeeping will ensure guests can fully relax.